This page was started because of a post I recently wrote where I talked about a system I had devised to get me better recordings of phone interviews. I wanted to expand on that post and tell where I have gone from there. Though I did my original design just 2 days ago, I have a completely different way of working phone interviews which seems a bit easier. I got the information from a post at Podcast Pickle. The quality of the two methods should be equal, but the ease of working the final mixing is much simpler the way kurt_eh at the Podcast Pickle forums recommended. Here is a rundown on the parts and setup you will need to make this work. I soldered all of mine myself, whereas kurt_eh used pre-packaged cables and connectors. Building it myself (both versions) cost $7. Buying the step down adapter from 1/8″ to 2.5 mm would have been $4 alone. I chose the cheaper route. To the left you see a graphic of how the cable comes out of the telephone and which part goes to each component. Inside the phone the tip is the speaker. The ring is the mic. The sleeve is the ground. You then go out of the phone into either the box device I built, or into your mixer. Again, going the mixer route is the better of the two. Here are a breakdown of the two methods. If you make your own box like I did initially, the key is to take the speaker (tip and grounded sleeve) and feed it to your headphones. Then the microphone (ring and grounded sleeve) into the phone, goes to your microphone input from your headset/mic, or your mixer can go out into that. The other end of the box will have the recorder. This will allow you to record just what comes out of the phone. * Then you can go into the computer with your regular mic and have a full quality recording on your end while recording the person to whom you are speaking into the stand alone recorder, i.e, the iRiver in my example. You could, alternatively go into the mixer and into your computer using Audacity, or any other recording program, to record yourself in the left (or right) track and the other person into the other track. But if you do it this way, then eliminate the box and record using kurt_eh’s method. 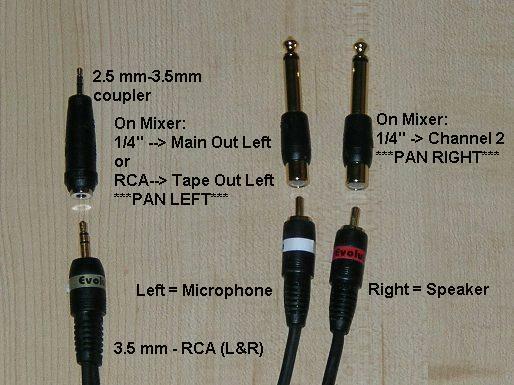 By using the cables as described in the pictures (or making your own with parts you have lying around) you can go right into the mixer and do all of your recording in one program on the computer. The key to this setup is to have the main mic that you are recording with panned all the way to the left (or right). Then you come out of your phone and into the mixer with the phone’s speaker going into a 1/4″ mic jack. Pan that one all the way to the right (or left) to get your stereo recording. These simply need to be panned opposite of one another to get a clean, separate, recording on each channel. I had trouble doing this via kurt_eh’s method. This was simply due to the fact that I already had parts and did not want to go back to the store. So I took each of the outputs and instead of going to 1/4″ jacks, I went out to RCA plugs. I plugged my speaker out (which becomes my second mic input) into the “Tape In” of my mixer on one channel. Then I plugged the mic in (which becomes an output from my mixer) into the “Tape Out” of the mixer on the other channel. Viola! 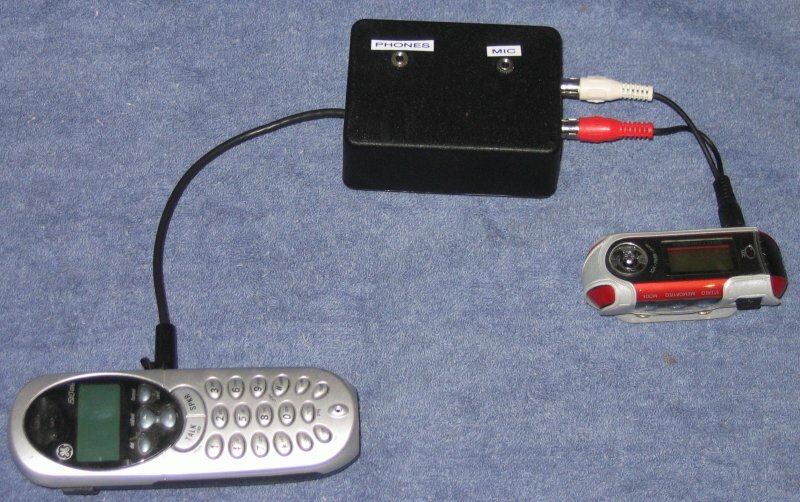 I could talk to the person on the phone and record separating left and right inputs into my computer recorder. This can seem all very confusing but begins to make sense when you start putting it together. On my phone, and I suspect just about all phones, when you talk into the phone you get some of your own voice coming back to you through the speaker. This is how you know the line isn’t dead. Have you ever been talking on a phone and the other person hangs up, or you get disconnected and you no longer can hear yourself? That is due to this wonderful feature of phones that lets you know when a line is dead. But… That causes problems for what we are trying to do. Now, whatever you say goes into the phone through the mic input, but back out through the speaker. So you don’t actually isolate the caller’s voice on his track in the recording program. There will always be some of your voice going out of the phone too. Anyone know how to remedy this? I am willing (I think) to pop open my phone and insert a resistor somewhere to stomp out this “feature.” But, I am not sure where to start digging. I could not get over the poor quality of the audio that I was getting out of the phone. I knew that if I was able to capture the sound straight from Skype, then it would be better than what the phone was giving me. In Linux you are not able to record a Skype conversation with Audacity. There is some kind of conflict in the audio devices needing to be used. I am not sure what that conflict is. Maybe someone can teach me how. But I have read quite a bit on the issue, and it does not currently seem to be possible. So what I am now doing is my mic through the mixer and then into the computer. That gives audio to Skype so that I can talk with the other person. I run the sound card output back to the mixer. My mic I pan fully left and the sound card input I pan fully right. Then I output all of that into my iRiver digital recorder. I get a complete stereo separation of the two voices for editing purposes. I recently did an interview like this. I have not gotten it fully edited yet, but it will be episode 19 at Missionary Talks. You can hear the quality of the other person on the phone compared with the quality of the conversation with John Yingling (episode 18) recoded with the old system. I welcome any feedback on this. My new setup as of August 2010. Thanks for the info and details. I’m working on mine. The $20 radio shack adapter I’m using to record isn’t producing a good audio quality for me. The phenomena you are talking about, the sound of your own voice coming through the speaker is called side tone. The only way I’ve found so far to eliminate it when using POTS (plain old telephone system) is using what is called a digital hybrid. The cheapest one I’ve found is the inline patch from JK Auio for around $300 but it only knocks the sidetoen down about 20db the hae another product called the Broadcast Host that will know it down 50db but that one runs like $435 or so at B&H there are a couple of other models from other companies that people say are even better but for more money.I think Telos is one. One way to go is to use one of the VoIP services that doesn’t have sidetone through the network but it seems you’ve figured that out though I thought Skype did have Sidetone. I have given this a shot (going through the mixer) and its not working all that well for me. I went out and bought all of the cable connectors from Radio Shack, but I think having to many connectors forces you to lose a lot of signal. Its a Stereo 1/8 Inch to 2×1/4 Inch Y Cable that may cut down on the interference, but I have my doubts. Plus it costs $25.95. I think I may have the issue that you are experiencing, I can hear the person speaking into the phone rather well (delayed a bit) but what they get on there end is an echo that I can not get rid of. If anyone has any ideas, I’d be a very happy man. I don’t know how to cut down on the “hearing your own voice” problem. I have since moved to a somewhat equally complicated method of using Skype. I record stereo into my digital recorder through my mixer. Just like I was attempting to do with the phone. But with Skype I am able to completely separate the two signals. 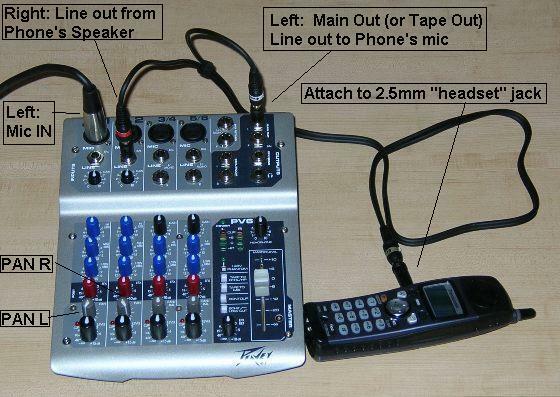 Nice detailed way to record a phone interview. I have one question if it is legal to do it unless you have permission. Not sure if it is allowed in some places. Yes, you will have to check the laws in your state. Since I do this to record interviews, I always let people know they are being recorded. Otherwise I would have no reason for this set up. Check with your local laws. Also, it is important to know the laws of the state where the person is you are talking with. Or, better yet, never secretly record a phone call. Some cell phones/cell services (and VoIP systems) do not have sidetone. Those circuits shown above should isolate caller/speaker perfectly. Radio Shack phone patches are pretty bad, but dyna-metric makes some clean ones (won’t solve sidetone problem though.) I’ve used a second phone to do the recording…but you invariably have to do some level tweaking to the recording.